Since this week started with Plough Monday and I am still saying happy new year to people I figure I am still well within the amount of time that I can talk about customs around the turning of the secular year. 2016 is over and done, and I was so glad to see it go, and that’s with knowing what 2017 would bring to the world when it’s only 20 days old. (See? I am trying not too be too political.) On the personal front, my year was a big mixed bag. Some highs, like less acute illness and seeing Pearl Jam while in the pit and only about 20 feet between me and the stage, and some lows, like sleep being elusive for months and still feeling like I was scrambling just to keep from falling into a metaphorical pit. Just like at Wep Ronpet in August, I wanted to leave the previous year behind and get a good dose of zep tepi happening. It’s much too soon to know if this is happening but I set some things in motion which might help turn my struggles into some success. Which leads me to the one resolution, which is also my word(s) for the year. It’s now five and a half years since I was hit with the “Yay I finished grad school now collapse!” exhaustion which has yet to abate. And it’s been four years since the last time I set out to try to find a reason why I could not recover from doing a Master’s degree. After much stalling and outright blanking out on doing so, I cold called and made my first appointment with a new doctor, which happens at the end of the month. Let’s say I am more than a little nervous about this. And I may throw a fit if I have to deal with another round of blaming my weight for something which started BEFORE my weight creeped back on. I’m tired. Tired of being tired all the time, tired of struggling just to take care of the necessities in my life, tired of being so worn out all the time that reading more than a few pages at the time had me wanting to nap. This world has gotten more overtly scary for someone like me, a queer gender non-conforming woman who’s a polytheist and magic worker. This is no state for me to do my part in restoring ma’at and I am tired of being on the sidelines. Ma’at must prevail. It will eventually, as it always does, but it is an active process. I want to carry it with me at all times. With the reports of hate crimes after the U.S. election I was hit with a strong knowing that now was the time to get my first tattoo. I’ve only wanted one since I was 10 but I could never decide what I wanted for the first design. 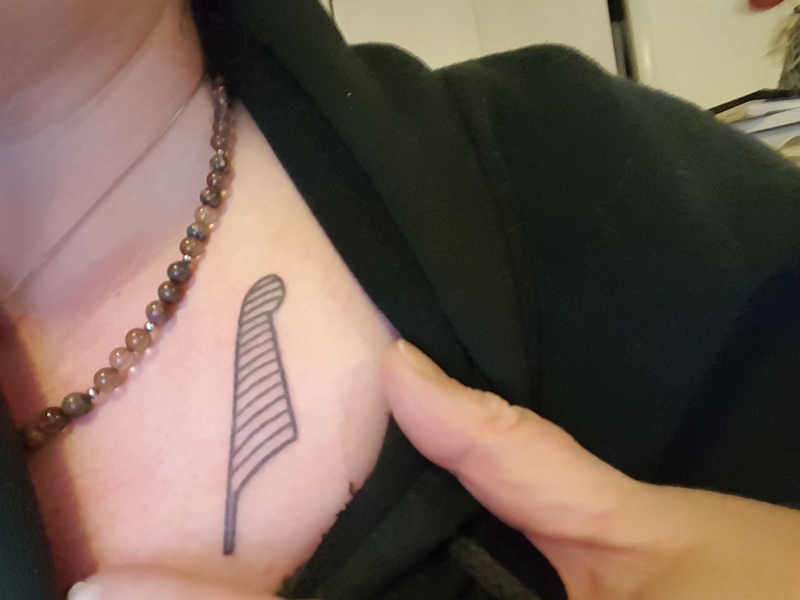 Then it came to me, the hieroglyph for the ma’at feather on my chest. I asked around, got the name of someone who does great blackwork tattoos in my area, made the appointments, and last Thursday it happened. The tattoo is healing well and swiftly, for which I am thankful. And now ma’at is always with me. I’m going to need it. We are all going to need it.